490S Strobe - Blue Max Lighting & Emergency Equipment Ltd.
Tomar Model 490S-T hazardous location strobes are UL listed for use in Class I and II, Division 2 locations. This model is available in either 12-80 VDC or 120 VAC configurations. The 490S-T features a hermetically O-ring sealed Lexan lens, and polyurethane potted power supply for complete protection from moisture. This unit is UL NEMA 4X rated, and may be operated in any position. The high efficiency, solid state power supply is polarity-protected and utilizes built-in filters to guard against radio interference and spike voltages. These warning lights are ideally suited for installations in chemical and petrochemical processing facilities, sewage treatment plants, off-shore and dockside installations, as well as agricultural, commercial, industrial, mining and marine facilities. Light Output 50 candela eff. Do not install where the operating temperature exceeds the ignition temperature of the hazardous atmosphere. 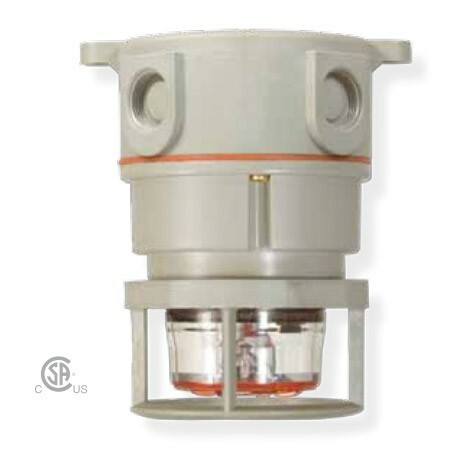 Hazardous Location visual signaling beacon shall be Tomar model number series 490S-1280T, 490S-120T or approved equal. The beacon shall be UL Listed Class I, Division II, Groups A,B,C, and D; Class II, Division II, Groups F and G; and Class III for use in specified hazardous locations as classified by the National Electric Code. The light source shall be a plug-in field replaceable single-flash xenon strobe lamp. The warning signal must have built-in RFI filters to protect against radio interference and spike voltages. It shall be polarity protected, and have a power supply fully potted in polyurethane. Voltage ranges shall be 12-80VDC or 120 VAC. 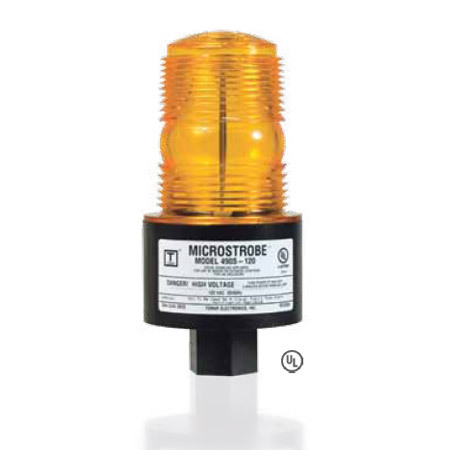 The warning light shall be rated NEMA 4X and have a screw-on Lexan® lens.